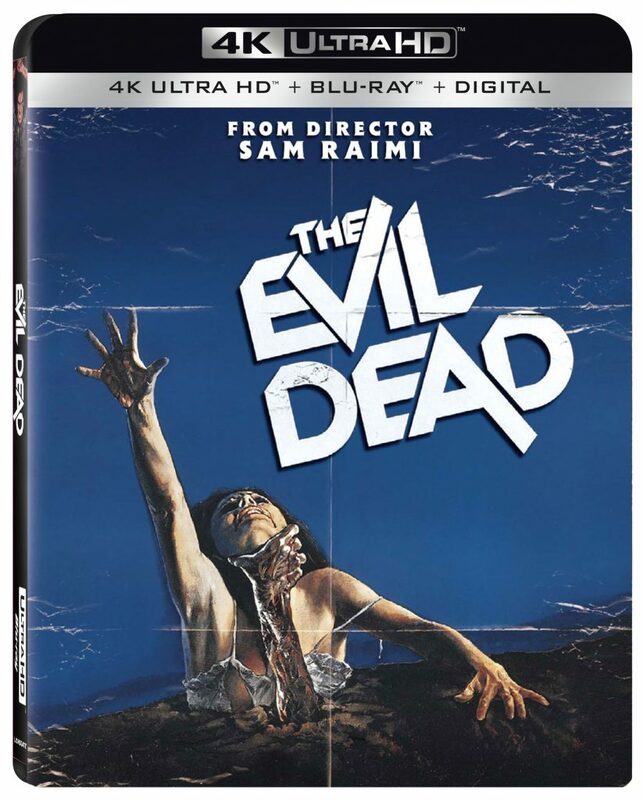 ‘The Evil Dead’ 4K UHD Review! Perhaps the best horror film of all time and most certainly the most magnificent cult film of all time that gave us Bruce Campbell and Sam Raimi to the world – ‘The Evil Dead‘ from 1981 is truly an extraordinary movie. This super low budget film with tons of gore spawned two sequels, a remake, and even a very successful 3-season tv series on Starz, not to mention countless toys, comics, and video games based off the film. Sam Raimi was just in his 20s when he made this movie with his family and friends, all shot on location in the middle of the woods, much to the chagrin of the actors. They powered through it and it became a huge success with big financing for a movie of this caliber and a winning review from the horror master himself Stephen King. The film follows five college kids who take a long weekend to have a good time in a remote cabin in the woods. Upon there, an old audio recording is played that unleashes hell and demons that possess the living into murderous and sadistic creatures. It’s as simple and every bit of horrific and gory as it sounds. The way Sam Raimi frames his images and actors is nothing short of fresh and amazing, which breathes new life into this genre at the time. With all of the film’s faults, it still is a perfect film still to this day. I’m just happy to have it on 4K UHD now because the video and audio presentations are quite amazing. Previous bonus features on the many releases that came before this are not included, but rather a sole audio commentary from several years ago from Raimi, Campbell and Rob Tapert, which is some of the most fun you’ll have listening to a commentary track on any movie. Consider yourselves fortunate to have ‘The Evil Dead‘ on 4K UHD because it’s fantastic in every way. More than 35 years ago, a low-budget horror movie roared across movie screens and changed the velocity of fear forever — and made a cult legend out of Bruce Campbell in his iconic role as the lethal, wisecracking Ash Williams. Now, for the first time, you can experience the ferocious ingenuity, relentless shocks, and gore-gushing havoc of the original Sam Raimi masterpiece in 4K! My Bloody Podcast #25 – ‘CREEPSHOW’! This entry was posted on Thursday, October 11th, 2018 at 2:45 pm	and is filed under Film, News, Podcast. You can follow any responses to this entry through the RSS 2.0 feed. You can skip to the end and leave a response. Pinging is currently not allowed.